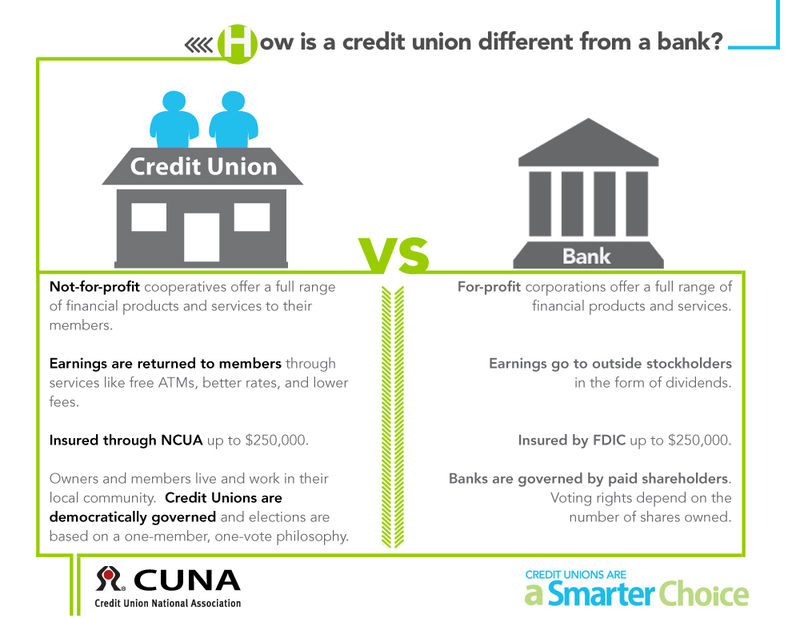 Credit unions have been around for a long time, but we still get asked quite frequently about the differences between a credit union and a bank. If you are new to credit unions, or maybe have heard about them but didn't know what they were, then this information is for you. • Not-for-profit cooperatives offering a full range of financial products and services to their members. • Earnings are returned to members through services like free ATMs, better rates, and lower fees. • Insured through NCUA up to $250,000. • Owners and members live and work in their local community (USCCU members live, work, worship, or attend school in Davidson, Rutherford, Sumner, Williamson, or Wilson counties, TN). • Credit unions are democratically governed and elections are based on a one-member, one-vote philosophy. • Earnings go to outside stockholders in the form of dividends. • Insured by FDIC up to $250,000. • Banks are governed by paid shareholders. Voting rights depend on the number of shares owned. For more information on US Community Credit Union, or the credit union difference, contact us at 615-256-8712.